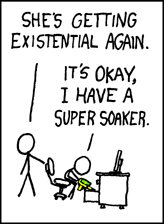 Is greannán gréasáin é xkcd, cruthaithe ag Randall Munroe. Foilsítear faoi chóipcheart Creative Commons Attribution-ShareAlike 2.5 é. Nuashonraítear é gach seachtain ar an Luain, ar an gCéadaoin agus ar an Aoine. Déileáil sé le ábhair matamaitice agus eolaíochta de ghnáth, uaireanta ag baint úsáid as léaráidí matamaitice cosúil le léaráidí Venn. Úsáideann an greannán stíl ealaíne an-bhunúsach, ní ach línte dubha iad na caractair, ach tá cúpla greannáin a thaispeáineann tírdhreacha nó dathanna. Ar an bhfórmhór, áfach, tá an bhéim curtha ar an téacs in ionad an ealaíne.